Join the discussion on our forums! Come discuss Muck Hunter over in our dedicated Muck Hunter discussion topic. A situational card, but certainly playable. It could swing some pretty good value for 5 mana. Imagine this in control Warrior with Garrosh or Whirlwind. As others have said, even with Jaina you're getting awesome value. most class will benefit . Mage : DK jaina , ping . Rogue : fan of knives . Sooo, is nobody going to talk about the card's amazing artwork? I mean, Team 5 obviously didn't look at the artwork because they gave this card a male VA like the idiots they are. Lmao it is flawed, the bolt in the wrist crossbow turns into her arm? To be fair, female Worgen do tend to be pretty growly. Have you heard Gilnean Royal Guard? That looks more like cleavage than pecs to me. That's just how an angry female Worgen looks. This feels unfairly powerful like several of the other cards of this expansion. 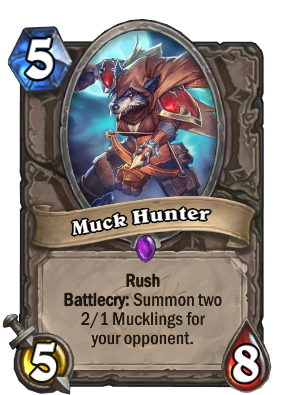 I mean come on now, Rush, huge stats and whirlwindable easy minions that can also be abused in a plethora of other ways. 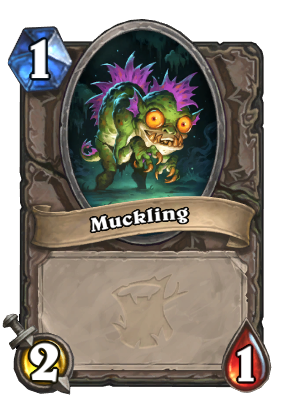 The funny thing is that even if we remove both Muckling atk to its health, it's still not a really awful minion yet ^^ (5/4 rush for 5 mana, a 5 mana Kor'kron Elite that can't go face), which those enemy-summoning cards generally are. First glance synergy with Whirlwind and Unleash the Hounds. Nice body if you have a way to deal with the Mucks. If you combo this with some form of low damage board wipe its pretty good. Or if you have Pyromancer on the board. Despicable Dreadlord. This could maybe be played in combo priest because of high health pretty low cost minion that could help you with board control?